Maintaining property lines and boundaries is one of the most often overlooked forms of protection from timber theft, trespass, and encroachment. 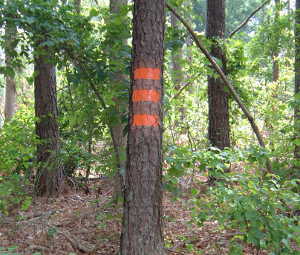 Cape Fear Timber Company can locate and mark property corners and boundary lines using a special, high-quality boundary line paint. This keeps lines clearly visible for at least 8 to 10 years. In addition, we recommend that “Posted” signs be installed along the boundaries. Other benefits of painting boundary lines: reduces landowner liability, improves timber management activities, and may eliminate the need for an expensive boundary line survey in the future. You can be assured of a high-quality job when you hire Cape Fear Timber Company to perform boundary line maintenance on your timberland.